So many common misconceptions about Publishers Clearing House. Find out what’s real and what’s not. Publishers Clearing House Sweepstakes real facts. The Publishers Clearing House (PCH) sweepstakes is a contest that is open to residents of the United States of America and also Canada. The sweepstakes has some incredible prizes up for grabs, and one thing that many people don’t realize is that there is no minimum spend, or even any purchase at all, required to enter. Anyone who lives in a qualifying country can enter the Publishers Clearing House Sweepstakes. All you need to do is contact the Publishers Clearing House to request your entry be registered. Americans can enter by post, telephone or online. Canadians must telephone the Publishers Clearing House to enter, and can use the automated system to register for the next sweepstake draw. You can find the telephone number for the Publishers Clearing House on the PCH website. Is Publishers Clearing House Sweepstakes Real? The Sweepstakes are free to enter, and are not the same as a lottery. 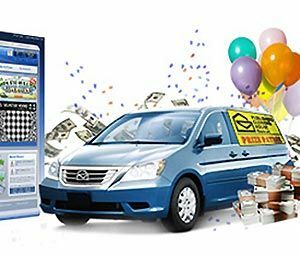 While the goal of the Sweepstakes is to promote products sold by the Publishers Clearing House, and you can register your desire to enter while you make a purchase, you are not obliged to buy anything. Buying Won’t Help You Win. Your chances of winning without a purchase are the same as the chances of someone who buys something. Of course, if you do make a purchase you may qualify for a premium offer. The premium offers are not the same as winnings, they are awarded to people who comply with the offer’s instructions and are more like a “free gift”. Anyone who wins a Publishers Clearing House prize of more than $500 will be notified by post, or via the PCH Prize Patrol, in person. All of the winnings go straight to you, with no processing fee, handling charge or tax coming out of the winnings. Note that no-one except the Publishers Clearing House is authorized to contact winners, so if you get a message claiming to be from a celebrity, or a third party that is processing your winnings “for a fee”, ignore it – the message is a scam. I realy hope 2 win the 2MILL Plus more , I ben piaying the contest[PCH] 8+1/2 years or more I mist out in 2015, Ihope that you dont pass me by I wood hope that yu ring my bell, the 2 black door bells in the mindls dont the one on top of the 2 black is the 2fl tthat my bell, thank you very much. i WANT 2 WIN 2MILL PLUS MORE THANK YOU. YEAS THAT I AM THE REAL JOHN SEGARRA THAT U PASS UP IN 2015 I HOPE THAT U STOP HEAR ON 6/30/2017. I want to win an unclaimed prize 20 up for Grabs. $10,000.00 – A week for life Dec.23rd from PCH GWY No. 6900. Yes! Yes! Yes! I want to win! Publishers Clearing House Thank you for this exciting opportunity! 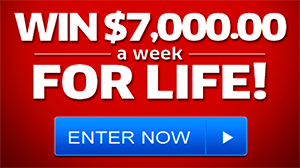 I would love to be the win $7000.00 a week for life. I just feel like it is a scam. There is so much I would love to do with this type of money. I have been wanting to start a rehab for aggressive dogs that are put down in kill shelters, and with that combine a homeless shelter for humans. But have not had the money to do so. This type of money would give me a start. I need to do this before I lose my kidney. I will lose my kidney eventually due to a massive cyst sitting on my adrenal gland, doctors decided not to remove clusters of cyst because they were not (cancerous) so now the cluster of cysts have become one large cyst and at the moment it is stable. But as it grows I will lose the kidney. I would love to have the rehab and homeless shelter running at full capacity before then with someone in place to care for it. This is something needed in every city, state, country, all across the globe. Alas, I play the games just for the fun of it. Knowing it will never happen. Just not in the cards for me.. I have been told that PCH does nothing online. And you have to purchase stuff to win. Thanks for the free games though.. I am hereby claiming that my initials MV are the initials required to win $100.00 for the $7,000.00 Prize per Week for life. YES PCH 1830 02340406467,03062,I WANT TO REDEEM VOUCHER ID 485762 AND CLAIM AND ACTIVATE $1,000.000.00 SUPER PRIZE GWY 4900 VOUCHER ID 485762, PRIZE STAMP 4900 I WANT CONFIRM FROM THIS NOTICE TO WIN I AM CLAIMING TO WIN INSTANT WIN FOR $1,000.00 P-LUS $10,000.00 GOLDEN TICKET OPPORTUNITY PCH GAMES ,YES I WANT TO WIN AND CLAIM AND ACCEPT TO ENSURE THAT NO ONE ELSE BUT I JOSEPH NSOAH TO WIN ON 31ST AUGUST , YES I AM HERE TODAY ACCEPTING AND ACTIVATING TO WIN, MY PRIZE ACCESS CODE 4900 ,PRIZE STAMP 4900,PRIZE ACCRUAL SLIP 4900 VOUCHER ID 485762,PLEASE ACTIVATE PC288,PC238,PC988,PCW71, PCW70,V–3080 AND CONFIRM MY NAME ON THE BIG CHECK AND THE PRIZE PATROL TO HAND DELIVER TO ME PERSONALLY AT MY LOCAL TV AREA, AT THE EARLY SPECIAL EVENT, THANKS FOR YOUR HELP. YES PCH, 1830, 02340406467, 03062, ACTIVATE, AND CONFIRM, . YES I AM CLAIMING MY ENTRY TO WIN $ 5,000.00 A WEEK FOR EVER ON AUGUST 28TH GWY 3080 PLUS WINING $ 10,000.00 CASH PRIZE, YES ACTIVATE PC288, PCW70, PC238, PC988, PC288, ACTIVATE AND MAKE ME THE NEXT PUBLISHERS CLEARING HOUSE P.C.H.COM WINNER AT THE EARLY SPECIAL SELECTION LOOK EVENT ON 30TH DECEMBER, THANKS AGAIN. I would truly love to be the winner of PCH Giveaay no. 4900 to be awarded on 12/30/2015 so that I can help my nearby neighbors who desperately need a hand. This would make me so happy, I’d also thought of putting together. 7 day a week soup kitchen, which I am doing research on how to do this. Thanks for considering my wishes. God bless all of you at PCH! Merry Christmas! YES YES PCH I AM HERE TO DAY TO CONFIRM AND SUBMIT MY DECLARATION OF DEPOSIT NOTICE TO CLAIM TO WIN $ 10,000.00 A WEEK FOR LIFE, YES I WANT TO RESPOND TO THE DECLARATION OF DEPOSIT NOTICE I AM SELECTED AS THE WINNER THIS SPECIAL EARLY LOOK EVENT FROM GWY 4900 TO RECEIVE $ 10,000.00 A WEEK FOR LIFE THAT’S THE DOUBLE THE STANDARD $5,000.00 PRIZE AND I WILL DOUBLE THE CASH, YES I AM HOPING TO MEET THE PRIZE PATROL ELITE IN PERSON AND I WANT MY NAME JOSEPH NSOAH ON THE BIG CHECK, AND THE PRIZE PATROL TO HAND DELIVER TO ME PERSONALLY WITH BALLOONS AND CHAMPAIGN AND ROSES AT MY LOCAL TV.AREA FRONT DOOR,(03062)-02340406467) YES I AM HERE TO CLAIM AND BE THE NEXT PUBLISHERS CLEARING HOUSE, PCH.COM, BIG MILLIONIERS MAKING OPPORTUNITY WINNER AT MY LOCAL TV.AREA FRONT DOOR, THANKS AGAIN FOR THE HELP. I need to win the 3m dream house giveaway, so i can buy, well now 4 new houses. My family all needs a nice home to finally call their own. My daughter any day now is about to have my first grandson/grand baby. Their house is way to little for her step son who is 2 y/o and not fit for anyone to live in, but atm is all they can afford. Plz pch come and see me sept 8th/2015. My family needs you. thanks, have a great weekend. need 2 win 2 pay off bills and buy a house. YES YES YES PCH FRONT PAGE, PUBLISHERS CLEARING HOUSE. PCH.COM . GWY 4900. 1,000.000.00 A YEAR SUPER PRIZE GWY 4900. I’M CLAIMING 5X ENTRIES TO WIN $ 1,000,000 FROM THE PUBLISHER CLEARING HOUSE SWEEPSTAKES ON JUNE 30TH 2015 I WANT THE PRIZE PATROL TO COME AND KNOCK MY DOOR FOR MY DREAM COME TRUE THANK YOU VERY MUCH. Hii pch front page .pch.com I will like to gwy 5166 $1,000.00 area t.v plus 2.000.000. At once at the early look event on 30th June 2015. Hii I w to claim my 3x entries to win $1.000.00 plus gwy 3577 $1000.000.00 on the 27th February from Gwy 4900 $7,000.00.a week for ever prize at the early look event thanks I want to win my unique super prize my prize number 4900. Thanks. Hii pch I am still searching with pch search and win. And I claim my unique super prize number 4900 to win $1,000.000.00. And all the bonus I believe the pch search and win wI’ll definitely direct me to be the winner. Please keep on praying for me. Thanks. I will love to win so my friends and family can enjoy their self happy holidays to ever one all over the world be blessed ever one. I want to win PCH $5000. A week for life.i would love to experience the feeling of knowing that me and my family can be free of debt! I feel we have struggled for to long! Giving up is still not an option! Thanks to PCH for the chance of a lifetime! I would love to win 10,000.00 a week for life Gail Wilbanks. PCH I want to to be Privileged to win the 5,000.00 s week for life prize and the 1,000,000.00 a month for life prize what a real Privilege it would be to win those prizes . I will be so grateful for ever to PCH and willing do even work for PCH what a privilege that would be as well.